Forged counterweighted 4140 chromoly crankshafts are an excellent basis for your next performance build. 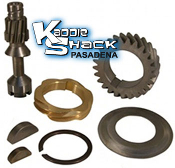 These crankshafts come in a variety of strokes with standard VW journals. Forged counterweighted 4340 chromoly crankshafts are a step up in strength from the 4140 cranks, race quality, and are a superior choice for your next high performance build. Forged race quality counterweighted 4340 chromoly cranks are a step up in strength from the 4140 cranks. Lighter weight than VW journal, revving faster, & providing better clearance inside the case on stroker motors. Forged 4340 chromoly counterweighted 69mm crankshaft with VW Journals. 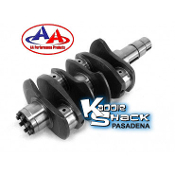 Forged 4340 chromoly counterweighted 78.8mm or 82mm stroker crankshaft with Chevy 2" Journals. Forged 4340 chromoly counterweighted 78.8mm or 82mm stroker crankshaft with VW Journals.